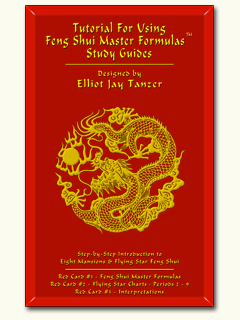 This 8 1/2 x 11 laminated Feng Shui Master Formula Study Guide is an essential tool for any feng shui practitioner doing Flying Star or Eight Mansion Feng Shui. This card has everything you need: both the Solar and Lunar Calendars with their change over dates, Animal Signs and elements along with the Personal Trigram (Gua) Elements and Numbers. 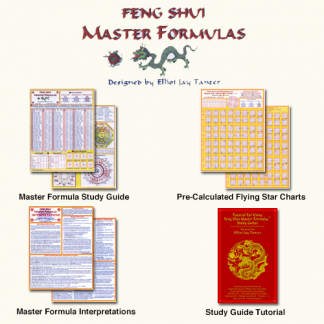 All these charts are combined in one easy to read reference chart, plus the Best and Least Favorable Directions for each Gua Number, and all the House Trigram charts on one side. The reverse side features Flying Star Reigning Period, Annual and Monthly Flying Star charts, Lucky and Unlucky Numbers, location of the Three Afflictions, Zodiac Compatibilities, Ba-gua attributes, 24 Direction Compass with degrees and Animal Signs, and other reminders which should assist you in integrating Flying Star and other compass techniques into your feng shui practice. The more you use this card, the more ways you will discover the card can be used.